Make commencment memorable One of the ways this day is made special is by the commencement speech given to graduates. Universities schedule speakers that can deliver words to their outgoing graduates that will congratulate them, commemorate the day and inspire them to pursue the loftiest of goals. Be they intellectual leaders, successful businesspersons or noteworthy alumni, many universities strive to bring in the brightest of minds to speak to their departing class of students. We at the Spectator have often wished – and hoped – that VSU would secure someone we could be proud of for our graduation. It would mean a lot to the student body, and it would reflect well on a university’s administration that works hard to prove its care for its students and alumni. There are many options VSU could pursue, but this year offers a special opportunity: A diaspora of political candidates are already stumping for 2020. Cory Booker, Kristen Gillibrand and others have already stepped up to give commencement speeches for universities in different parts of the country. VSU could reach out to someone of their ilk for a chance at a truly memorable commencement speech. And if they wanted to secure someone with a connection to VSU, we’re sure Stacey Abrams is available. After all, she made it clear that VSU was an important place for her gubernatorial campaign. Someone like this would serve all the purposes of a great commencement speaker, and would bring plenty of prestige to VSU. The speaker doesn’t have to be a politician. There is a wealth of options for our university to pursue. But whoever is chosen ultimately reflects the prestige of the university and the esteem it holds for its alumni. 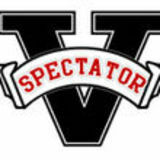 We at the Spectator hope they’ll choose wisely. growing diversity in media. “As I examine movies for their generational import, I have been thinking a lot about representation and how it has changed through the decades,” he said. “It grew even more important after watching a little boy’s reaction to ‘Black Panther’ last year and how excited he was to see black men and women be heroes in a way that I’ve never seen before and I’m certain he never had either. For those kids and so many more, representation matters. It matters for adults as well.” The film festival values may be dipped in education, but its supervisors want it to be fun too. Daniel Bataille, a senior and one of the students heading the festival, said that’s pretty much the class’ goal. “They are movies that most people have already seen, but we’re trying to make it a fun thing for students,” he said. “We’re going to have concessions and food available [too].” But while the festival seems ready to move forward, there’s still one big issue: funding. That’s why the class is looking for sponsors. Currently, the project is in need of a cotton candy machine, a popcorn machine, snacks, candy, drinks and tickets, as well as funding to secure the rights to the movies. The proceeds generated will be donated to The Haven of Valdosta. It will begin at 5:15 p.m. and end at 11 p.m. on April 12 and 13. Photo courtesy of Wizards of the Coast The Dungeons & Dragons tutorial is coming to Valdosta on April 27.
tions with characters they might encounter on their journeys. Kyle Cook, a freshman, and member of the group, has been a dungeon master and revealed what drew him to the role. “I enjoy the feeling of creation and giving my friends something to enjoy,” Cook said. “That is where the joy in D&D comes from, for me. Giving something for people to experience.” The game undeniably brings people together. To my right is my character creation lifeline and fellow reporter, Payton Fletcher. I consulted his “Player’s Handbook” more times than I could count, sifting through the fantastical lineup of vivid characters. I stared at the blank character creation sheet. It looked like the control panel to a nuclear missile. Everyone else around me flashed experienced hands across the paper, filling out boxes and character stats I had thought were a printing error, or hadn’t even noticed. I clutched my gold dice in my hand, their Arabic numerals the only familiarity in this unknown fantasy world. I’d like to say it got easier. It didn’t. Maybe it was just that I got used to it, the sheer vastness of it all. What intimidated me wasn’t so much the mechanics of the game, but the open-endedness of it. The amount of times I heard that it was “up to me” was frightening. I had never been given this much free reign over a hypothetical person’s life before. Some characters are, admittedly, stripped from the works of J.R.R. Tolkein, but they have at least had the common decency (or legal wherewithal) to modify some of the less ubiquitous names (hobbit = halfling, ent = treant, balrog = balor). In truth, the majority of D&D is drawn from various contemporary fantasy and pulp-fiction sources. Even the work of Lewis Carroll and H.P. Lovecraft make an appearance. This doesn’t take anything away from the game. If anything, it makes it better. It draws on hundreds of years of fiction and myth-building and brings it all right to the players fingertips like one great big nerve-ending. The player is literally at the command of some of the most formidable mythological forces of all time. At first, I settled on a mute bird person as my character. He came from the streets and could only speak in mimicry. He made a living impersonating tourists, and maybe did a little fraud on the side. Who knows? He wasn’t very strong, but he had a way with words. Or at least until I realized that I shouldn’t waste points for charisma, which determine your character’s use of speech, on a character who could only, due to an ancient curse, repeat what other people said. So, after much thought, I switched my race to an anthropomorphic cat. He’s a wanderer and loves shiny objects. The depiction of the race in the book showed a tall, slender, spotted yellow cat grasping dramatically onto a tree branch and surveying a distant land from afar. The breadth and depth of fanmade art is absolutely astounding. D&D has spawned everything from print art to weapon replicas to novels, sometimes based on player’s own experiences. That was when I realized that what I was doing had nothing to do with fancy swords and bags of gold and everything to do with storytelling. I was building a narrative and creating a character arc while establishing motivation, origin story and how those factors would affect the characters’ reactions with other characters and events throughout the (hypothetical) campaign. And it was fun! This insight is not lost on any avid D&D players. Many enjoy benefits from the game’s engaging style. “It’s an engaging form of communal storytelling combining adventure, imagination and problem solving that we think folks would really enjoy,” Costello said. This level of in-depth character creation leads to interesting interactions between characters and players. “You can tell stories, you can have fun, you can just mess with each other, even,” said Kade Hubner, a freshman who, along with Cook, has formed many strong relationships through the game. “It’s such a unique, amazing game.” D&D is less of a game and more of a loose set of guidelines. It’s essentially a commercial reason to set your mind completely free. Well, maybe not completely. It’s like a blank canvas with a border, but even that border is only a suggestion. Photo Courtesy of Solange Knowles’ Instagram Solange Knowles posing for the cover of her newest album, “When I Get Home”. “I think that Solange has stepped into a new real as it pertains to her craft.” the album. Amongst the masses, some of her fans LOVED the album while others were not impressed. Either way, Solange provided the masses with an album that can stand the test of time. Her visuals were great as always, and I think that this time, she raised the bar on what should be expected from her next album release. She is in an era where she’s making music that portrays and emphasizes how she feels. And that is what art should be: expressing how you feel, not what’ll make you sell. Photo Courtesy of Solange Knowles’ Instagram Solange displays her talents for creating visuals with this teaser shot, showcasing her ability to push the envelope . Photo Courtesy of Nipsey Hussle’s Instagram Rapper turned activist, Nipsey Hussle died at age 33.
public and distributing tickets. In turn, people are taking the tickets and selling them on resale sites, like StubHub and Seat Geek, for a profit. “Tasteless,” “tactless,” “TACKY,” “uncouth,” “disgusting” and “just ugly” are some of the things that I can think of to describe this heinous action. Like, why on Earth would you do that? Did your mother not raise you right? Apparently not. I want to apologize for this situation and say I’m sorry that people are taking advantage of your generosity. May he rest in peace. Kim Kardashian is on the cover of Vogue for May. *SHOCKER* (Asterisks are for dramatic sarcastic effect.) I’m tired of seeing the same people on magazine covers, but that’s a topic for another day. Anyway, in the issue, she speaks on several things, allegedly, like her social stance, being a mother and, surprisingly, her pursuit to being a lawyer… interesting. I’ll let that speak for itself. Céline Dion just announced that she’s going on tour. WE STAN A LEGEND IN THIS HOUSE. Go see the Canadian Queen while you can. Another word: Can we please restrict or limit people on sites like StubHub and Seat Geek? There is no reason why I should have to pay 3x the face value of a ticket, just because you beat everybody in the Ticketmaster line and bought seven of them and are trying to make a profit. That’s real lackluster behavior. I can’t stand it. I really can’t see some of my favorite artists sometimes because a ticket that originally cost $180 will be published on resale sites at prices like $490 or $620. Like, that should be illegal. Whatever. That’s all the tea that I have for this week. Remember to check back next week to get your teacup filled with more piping hot tea! SPORTS Column: Blazers’ head coach gaining offers Prince Robinson Jr.
Sports Editor parobinson@valdosta.edu Bent down, usually at the end of the Blazers’ bench, is an observant. Observing the screens, cuts and movements of his team, Head Coach Mike Helfer is a student of the game. For 14 years, Helfer has coached the Blazers, averaging 20 wins a season. Since 2017, the Blazers have made an appearance in the NCAA tournament. spotlight. Kerwin Bell (University of South Florida) and Carley Kuhns (Samford) are two notable names that have recently left VSU. Bell left after leaving the Blazers football team to the 2018 national championship win. Kuhns led the Lady Blazers to a 19-10 record before losing in the GSC title game against Lee. Helfer is revered in the basketball world, so his services will be vital somewhere. Coach Kuhns takes her leave, VSU begins its search Prince Robinson Jr.
Sports Editor parobinson@valdosta.edu VSU Athletic Director Herb Reinhard announced on April 10, Kuhns will not return as the VSU Lady Blazers basketball head coach. 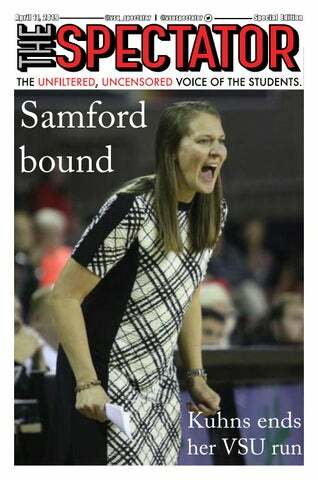 Kuhns has accepted the head coaching position at Samford University. The Lady Bulldogs had a 10-20 last season, ranking No. 7 in the conference. Former Head Coach Mike Morris retired after 17 seasons. Kuhns leaves VSU with a 66-29 overall record and 44-18 in Gulf South Conference play in three seasons. In 2017, the Lady Blazers won 22 games, marking the first 20plus win season since 2011. Kuhns leaves behind assitant coach Chandler Merkerson and graduate assistant Jayda Worthy. According to VSU Athletics, a national search for a new head coach will go into effect immediately. Photo Courtesy of VSU Athletics During the 2019 NFL offseason, many players’ stock can either rise or fall. Stephen Denmark, former cornerback for the VSU Blazers, has, reportedly, shined in a few private workouts. ON NOTICE Former Blazer rising on NFL Draft boards Prince Robinson Jr.
Photo Courtesy of VSU Athletics Kuhns was inducted into the Blazer Athletic Hall of Fame in 2015, for her efforts as a Lady Blazers’ student athlete. She recorded 1,133 career points under Kiley Hill. It has been six years since the VSU namesake was called at the NFL Draft, thanks to Edmund Kugbila. Kugbila, former offensive guard for the Blazers, is the highestdrafted player to ever play for VSU. The Carolina Panthers took a chance on the Ghana native in the fourth round. This offseason, Stephen Denmark has made a lot of noise in his workouts. According to Aaron Wilson, writer for the Houston Chronicle, Denmark has had private visits with the Cleveland Browns and New Orleans Saints last week. Wilson also reported that Denmark has a scheduled visit with the Pittsburgh Steelers. A date for the visit has not been announced. Denmark finished the 2018 season with 55 tackles, eight tackles for a loss, a forced fumble, three interceptions and nine pass deflections. Dane Brugler, NFL Draft Analyst for The Athletic, says that the Florida native quickly “developed a defensive mentality, displaying the outstanding speed and aggressive nature that drew the attention of NFL scouts.” In today’s NFL, Denmark has the intangibles and measurables of an NFL cornerback. At six foot one inches and 21lbs, Denmark has supreme size at the position. season, which ranked No. 27 in the NFL. Through the air, the Saints had struggles to stop opposing quarterbacks. The Browns batted with inconsistency at the position last season. Injuries plagued the Browns, but Denzel Ward, TJ Carrie, Phillip Gaines and others are set to be on the roster in 2019. The Steelers have Artie Burns, an aging Joe Haden and few rotational pieces in their cornerback group. For years, the Steel City has been looking to solidify the position. Denmark is pegged as a pick between the fourth and seventh rounds in the 2019 NFL draft. The NFL draft will take place in Nashville, Tennessee on April 25-27.